It’s time to make use of all that beautiful data that you’ve been collecting. Let’s retarget Pinterest users by showing them promoted pins. Each example will start with a blank audience. If you’re not sure how to make an audience and add filters, check out our guide on how to make an audience. I’ll show you how to retarget in 3 different ways to supercharge your promoted pins. 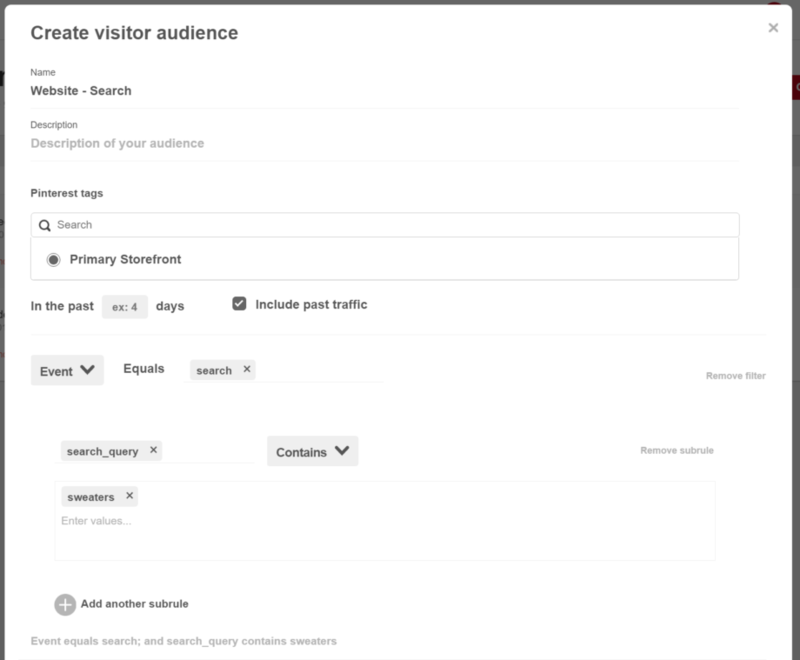 Once you have these audiences setup, use them to target your promoted pins. It happens all the time. Someone adds your products to their cart but forgets to checkout. Don’t worry, we’ll send them a strategically positioned pin to get them back on track. 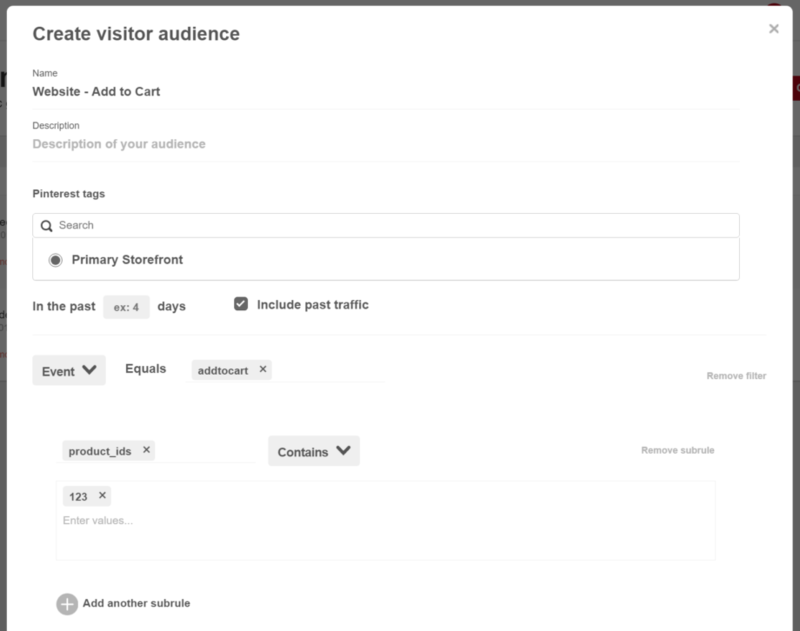 Once you have an audience setup, we’ll want to add 2 filters. Set the event to addtocart. Then add a subrule. Set the subrule key to product_ids . Set the value to the ID of the product you want to target. If you’re on Shopify, this is your product’s variation ID (How to find it). If you’re on WooCommerce, it’s the product id (How to find it). On Easy Digital Downloads, it’s the download ID (How to find it). Set the event to checkout. Set the value to the same ID that you set in step a). Start a new promoted pin. Not sure how? 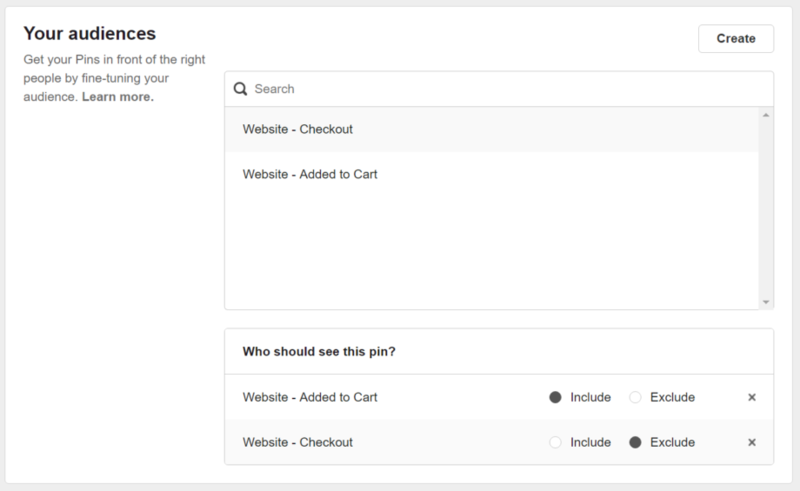 Follow the first 4 steps in this Pinterest guide on how to create a promoted pin. 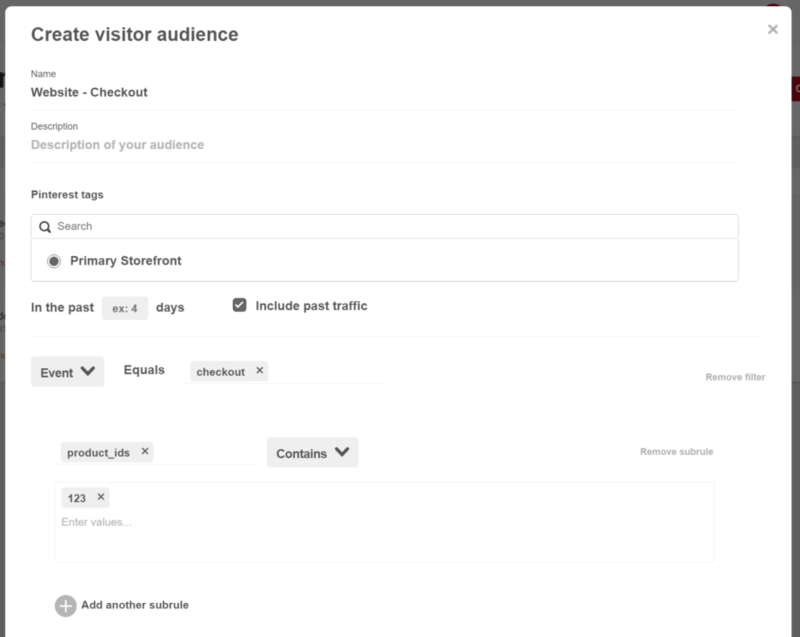 You’ll see a section labeled “Your Audiences” with all of your audiences listed within. For the audience you made in step a), click include. For the audience you made in step b), click exclude. Someone who has bought from you once is MUCH more likely to buy from you again compared to some random stranger. Bring them back to your store to look for more great purchases. Set the event to checkout . If you just want to target all customers, you can stop here. If you want to target customers of a specific product, add a subrule. Set the subrule key to product_ids . Visitors who browse but don’t buy can be a big source of revenue. Especially those that search for a specific product. We’ll make an audience that targets visitors who searched for a keyword. Set the event to search. Then add a subrule. Set the subrule key to search_query. Set the subrule value to the keyword you’d like to target. For example – if customers search for sweaters, set this to sweaters. And That’s it! Use these strategies with Pinoculars to get the most out of your promoted pins.